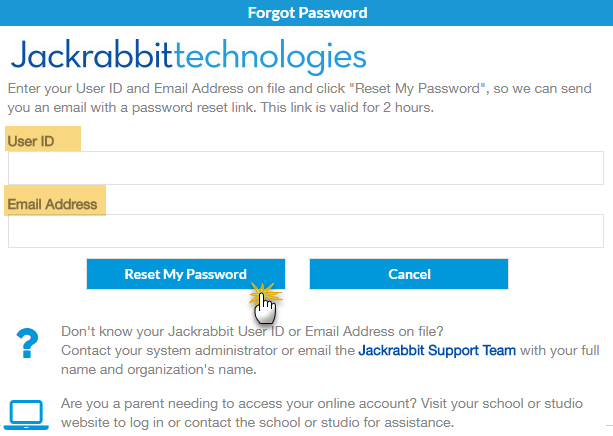 A logged in Jackrabbit User is able to change their User ID password from within the database. Point to Tools in the menu bar. Click OK in the confirmation pop-up. On the login screen, click I forgot my password. In the screen that opens, enter your User ID and the Email Address associated with your User ID. If you do not know your User ID or the email address on file, email Support at support@JackrabbitTech.com. Be sure to tell us your name and your organization name in the email. A link to reset your password will be emailed to your email address. This link is valid for 2 hours from the time the password reset was requested. Click the link, enter a new password, and then re-type the new password. Click Reset Password. You will then be routed to the login screen. Ask another User in your database for assistance. Email Jackrabbit Support for assistance. If emailing support, please include the organization name, User ID, and email address. Point to Tools in the menu bar and select Manage Users & Permissions. Click on the User ID involved. Click Reset Password to create a new temporary password and re-enter the password. Notify the User. They can then log in and change their password to one of their choice. If an incorrect password is entered three times in a row, the User ID is revoked for security purposes. The restriction must be removed by a User with permission to work with Tools > Manage Users & Permissions. Change the UserID log in Status drop-down from Locked Out to Normal.